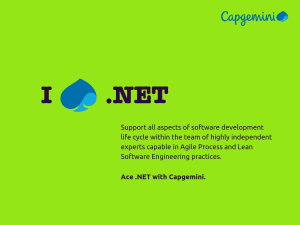 Capgemini is one of leading global companies offering consulting in IT technologies. The Cloud is fashionable – everyone’s talking about it, many use it, but few knows what it consists of, how it works, how to access it, and how to take care of it. It is us, Cloud Infrastructure Services, who understand the subject thoroughly. From high level services, through managing equipment and operating systems, internal or access networks to managing applications, IT operations, availability, configurations and changes.